You all are so generous! I'm sorry I have not been keeping up with this site and that my email at work is causing problems. Just to clarify: Bing is still safe and doing well at the Hairy Moose Pet Resort outside Nashville. We have had a number of inquiries about him. For various reasons, some interest was withdrawn by the potential adoptors. I am currently awaiting completed applications from three interested parties. (Debbie, I am to get an app to you this morning via your personal email). The first approved application will get him. We do have to check references and do a site visit, and over a distance, that can take a little longer. Be assured we are moving as fast as we can but trying to do what is best for Bing. I have no reservation whatsoever with letting him go as far as Calgary if that is to be his forever home. The person who is fostering him knows him best and will help me and the new guardian decide what will be the best means of transport. I have read that Chows are at risk from flight because of their short noses, but I also weigh Victory's advice heavily. American Airlines charges $100 for an animal to ride in the cargo bay if accompanied by a passenger. Often, you can get flight attendants to take that role. I have not checked in to what just shipping him will cost, but I have no doubt we can work it out. Thanks for all of your concern. Chowists are the best! Oh I hope he gets a lovely forever home. Bless him - if not Debbie well somebody else. I am keeping my fingers crossed for you Debbie and for Bing. Bing WILL get a forever home! Don't worry - we won't rest till he is in the arms of a loving guardian. As I was telling Debbie privately - I have not even met Bing. He is staying at a distance I can't easily travel within my usual routine, and I was out of town last weekend on family matters. This weekend, I hope to trek to the Pet Resort to see him. More when I meet him! Aaw! Give him a hug from me 'cos I want him really! It is just the ocean! He looks so like my M & M and would make a wonderful big brother for them! Will Bing accept a hug from a stranger...or turn away with typical Chow scorn. .................you are probably quite right Susan. Anyway, tell him I think he is beautiful - he will hear even though he might not let on. Hi all, thanks again for all your support and great emails! We filled out the adoption application and contract yesterday and sent off to Susan and as she posted she is going to see Bing at his foster home this weekend. My husband and are are trying not to get our hopes up to high in case he does not come to our home, but the bubbling underdercurrent of pure excitement comes to the surface now and again - we can't help it. I'm crossing my fingers and wishing and hoping and praying for you too!! I would love to see someone on this site give Bing his forever home. I will keep sending all of my good thoughts and comments to Susan. Chows are busting out all over Nashville. I think we have a little black boy Chow running loose in the traffic now. I will be staying in touch with the woman who is masterminding the rescue. I think I have gotten a reputation as the person to call. Meanwhile, charming Max the mix is still at our house with hubby saying everyday "How long is he going to be here?" Read my lips: till he finds a forever home! I promise I won't bring home anymore Chows, but Max is here till he's safe and loved elsewhere. I am hating to be in the position to decide who gets Bing. Luckily, his foster mom will weigh in, so it's not all me. I am looking forward possibly to meeting him tomorrow and telling him that posts about him are running to THREE PAGES now! Don't forget to get him I think he is gorgeous 'cos he looks a lot like M & M. Tell him a forever home is just round the corner - won't be long now. Bing is going to a new home! Just a quick message to let everyone who was concerned that we are in the process of arranging transport for Bing to his new home in Ontario, Canada. He will be with an experienced Chow family that has no children and a female Chow. We think that will be best for him since he has not lived with kids and he gets along great with females. The pet resort where he has been staying reports that he is getting more relaxed and tail waggy, and we have every reason to believe that he will do fine in his new situation. I have been in touch with Debbie and Bones to let them know Bing will not be coming to Calgary, and I so appreciate their kindness and understanding. It was a hard choice and I would love to have chosen a member of this site so I could stay in touch with Bing. I have not been a very good correspondent of late, but will try to keep you posted on his trip and arrival. Many thanks to you all for your prayers, concern, and suggestions. For Bing and me, God bless you! I am sorry that Bing is not going to Debbie - it would have been lovely but if he gets on with girl chows etc. I am sure he will be happy. Bless you for sorting it all out! First of all I would like to say that I was thrilled that there was a competition for Bing; he went from being totally abandoned to having 3 families wanting him! What a joy for chows and chow lovers everywhere. Secondly, as I said to Susan in my private email, whatever is best for Bing is great. We, of course, were sad to not get him, but know that Susan picked the right home for him. 2 young boys and a male chow is a very different environment than the one he went to! I am glad he went to a home with another Chow because they will have knowledge of Bing already! I am so happy that Bing got a forever home. Of course my vote went to Debbie, but I also agree, whatever was best for Bing was great. It's nice to see so many lovers of the breed come together in hopes to give an abandoned gentleman a place to live. It's still my hope that Susan catch up with the original owners and they pay for what they did to Bing. But if not, the outcome turned out good. Bing will have the forever home and family he deserves. Thanks to everyone who worked so hard to get Bing to a new home. Please remember how many unwanted, misunderstood Chows and Chow mixes are just sitting and waiting and hoping at your local APL. These are the ones that no one wants and the local Chow rescues have no room for...they too, are overflowing at the seams! My life was changed by my local APL who rescued 3 of the most wonderful creatures for me to find and bring home....and I thought that I was just getting "a dog"...Oh well...we all know that difference! and of course, my most dearly departed Mozart...who started it all... and still resides in spirit under the apple tree in the back. yeah for Bing! I'm so glad he found such a peaceful forever home. I hope we can hear how he does up there. Debbie - I'm sorry you weren't able to be his forever home, but I'm sure they did what was best for him. just wondering how Bing is heading to Canada and does he have to have a quarantine of sorts? You truly are an angel for working so tirelessly with him and I am sure many others! He sure is a beautiful older boy! Thank you for caring enough to want to give Bing what I am sure would have been a great home! 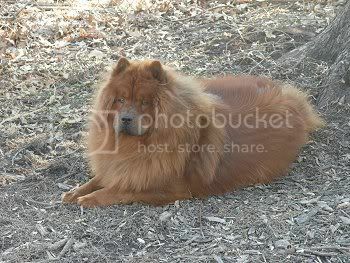 When you are ready again...there will always be a wonderful, precious Chow/ chow mix somewhere just waiting for you !!!! Because of my own dog, who I am rehoming, he had a potential home in Canada and I found with him that all he needed was Rabies vaccination to get over the border. So it should be fairly easy to get him to his new home. Susan sent me a few pictures and I meant to post this earlier....Bing has passed his Canadian kennel club good neighbor test and is now certified to visit at hospitals & seniors homes! Karen, that is just so wonderful - bless him! what a beautiful boy! Is that his new sister in the first pic? They look well together. I'm glad he found a forever home. His sister's name is Chloe but she was already there when he arrived. I don't think he was too sure about her at first but now they look like real siblings now!